The 2015 Japanese National Carcass Competition winner is a ‘master class’ the value of breeding and feeding to the genetic potential of the Japanese Black. Overall, the 30moa champion steer carcass graded JMGA A5. 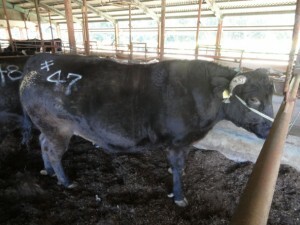 JMGA BMS #12, carcass weight 575kg, yield 71.4%. Price: JP¥6,948,875, or about $AUD82,076. How does this carcass performance compare to Australian production ? From a Western perspective, what is familiar about the breeding ? About 25% of the dam-side pedigree of the winning steer is not publicised, but Yasufuku 165-9 features as a grandparent in both sire and dam. Kitaguni 7/8 is the other dam grandsire. So from a prefectural/pedigree analysis perspective, this champion resembles many contemporary Australian FB feeders. The general difference perhaps is that the real genetic potential of the Japanese feeder is fully realised, whereas environmental impacts (most likely nutritional/economic ‘short-cuts’) may effectively set back many Australian feeders, which finish as much smaller carcasses with reduced marbling. 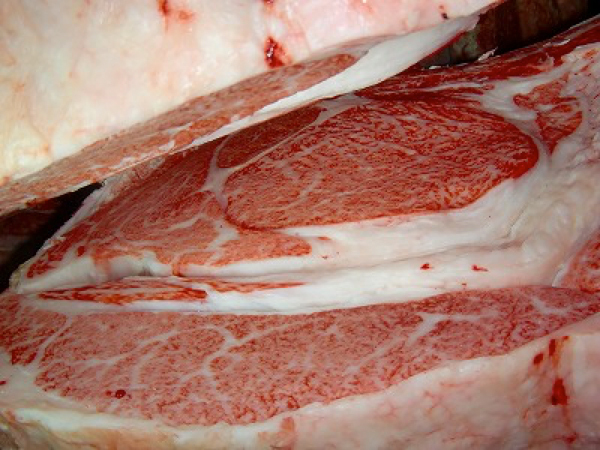 The lack of equivalent grading systems makes exact carcass comparison impossible, but does this ‘genetic potential’ explanation account for the massive difference between Japanese carcass performance relative to average Australian fullblood (Japanese Black) production – as revealed in much Australian carcass data collection so far ? In publicised Australian data collection summaries, average marble scores for FB carcasses are Aus-Meat BMS 7~8, which Japanese and CSIRO-published research (see study details here) describes as at best equivalent to JMGA BMS #3~4 (Tokyo 2015 Champion = JMGA BMS #12). Average Australian FB carcass weights are <420kg (Tokyo Champion: 575kg). 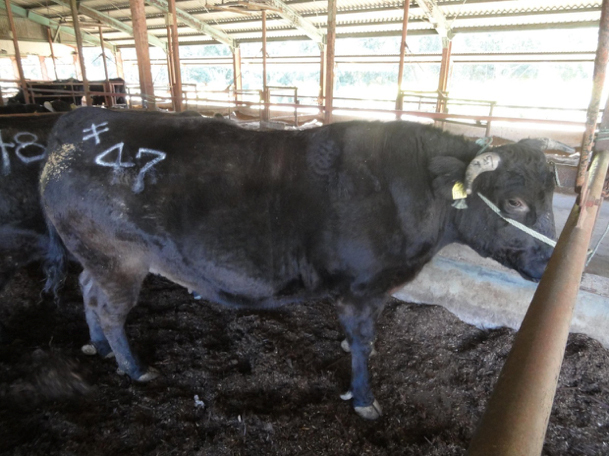 However, we are also aware of Australian FB carcass weights over 530kg at the (highest locally available marble score) Aus-Meat BMS9 being recorded from feeding (DOF) periods of 600~650 days, which is equivalence with Japanese standard DOF. Nonetheless, it is the Australian production carcass averages, from a small (but generous) range of data suppliers, that create the foundations for Australian measurement and ranking systems. Despite a complete absence of independent Australian field trial data to use as a benchmark, and despite broad awareness that individual feedlot regime variation is a fact of Australian fullblood production . So what distortions might occur if underlying local production systems (and, inevitably, subsequent sire rankings) are managed solely to achieve a truncated economic/quality (carcass) target, without attempt to fulfill the full genetic potential of the feeder ? For example, in feeding a very high barley ration for <400 days for a Aus-Meat BMS #9/CWT <400kg carcass. Perhaps the result is a significant accumulation of seam fat and other negative meat quality impacts which are not assessed at all in the Australian (Aus-Meat) grading system ? Clearly, this type of production is not striving to achieve ‘genetic potential’ results. Does use of the resulting data result in a distorted performance ranking system ? And lead in addition to industry breeding guidelines which are truly relevant only to ranking within a specific ‘economic target system’ rather than a comprehensive, breed ‘genetic potential target’ production system ? After all, comparing the pedigrees, the genetic potential of Australian Japanese Blacks and those reared in Japan does not appear likely to be anything near as dissimilar as the actual results we see in real comparative carcass performance. Especially in such a case as the 2015 Tokyo National Carcass champion.